I adore staring out at the sea, but at this time of year in Norfolk (England) it's too cold to look for long at a grey North Sea (the lumps on the beach are seals, not afraid to bask in the frigid wind). So inside my warm home, I thought it would be intriguing to look at a few illustrations of sea and water in children's picture books, especially as I want to try illustrating the sea. Looking harder at illustrations is always fun (in my opinion! 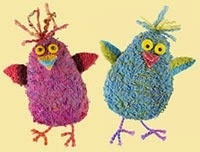 ), although sometimes I am stumped at how the artwork was created. For the first image, I'd never have known if the information hadn't been inside the book. 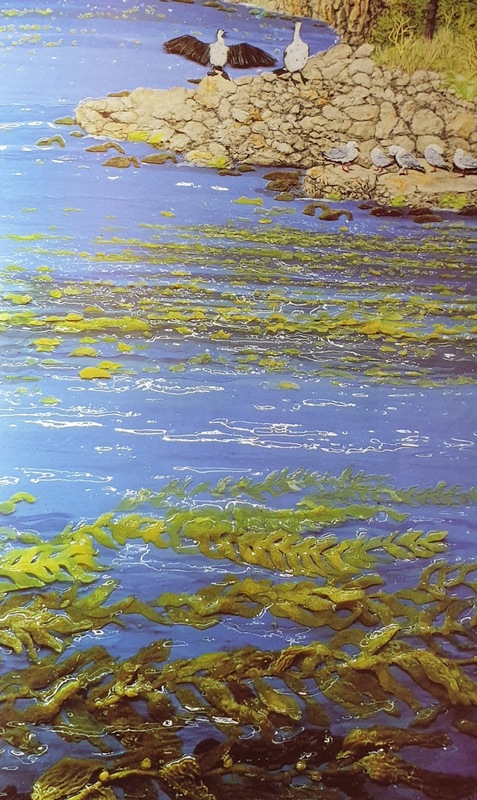 The kelp was modelled with translucent artist's clay and the seawater is resin. In The Hidden Forest I assume the lighting used in the photography mimics the natural reflection of light? However, sometimes simple paint can have the same impact, as seen below in Town is by the Sea. This is the bright, blinding, shimmering sea. Throughout the book there are many gorgeous, deceptively simple, atmospheric renderings of the sea. From childhood, Sydney was familiar with the coast and for the book he visited the mining town of Glace Bay on the eastern tip of Nova Scotia, Canada, to “feel the size of the sea”. He viewed exhibitions too and for the water he absorbed the expressive brushwork of Turner, and the French Impressionists. From Town is by the Sea, another illustration of the sea by Sydney Smith. 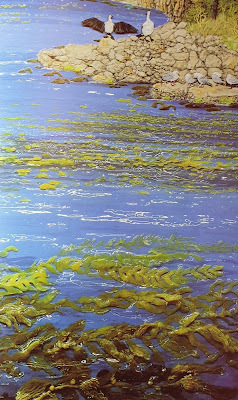 Sidney’s principal tip on painting the sea is to decide on the type of sea. In the book there is the bright, blinding, shimmering sea, a choppy sea, a quiet sea, and a dark sea. 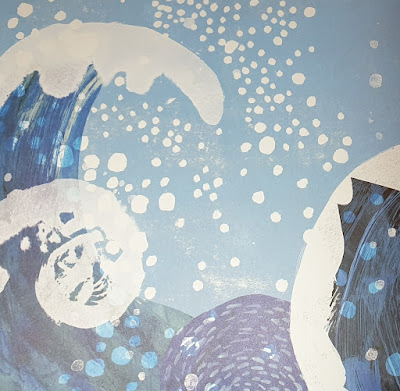 Then Sidney suggests becoming the motion of the sea with your brush, “dance with your brush,” and don’t worry about detail because the sea is always moving. Be expressive. 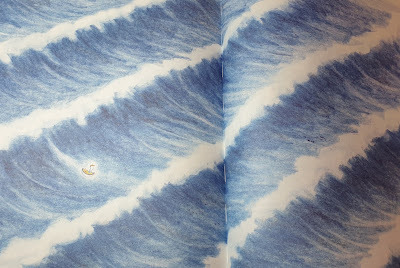 Traditional watercolour is used for Town is by the Sea, along with Pentel brush pens and gouache paint (akin to watercolour mixed with chalk) used dry for the white frothy tips of the waves and the light. 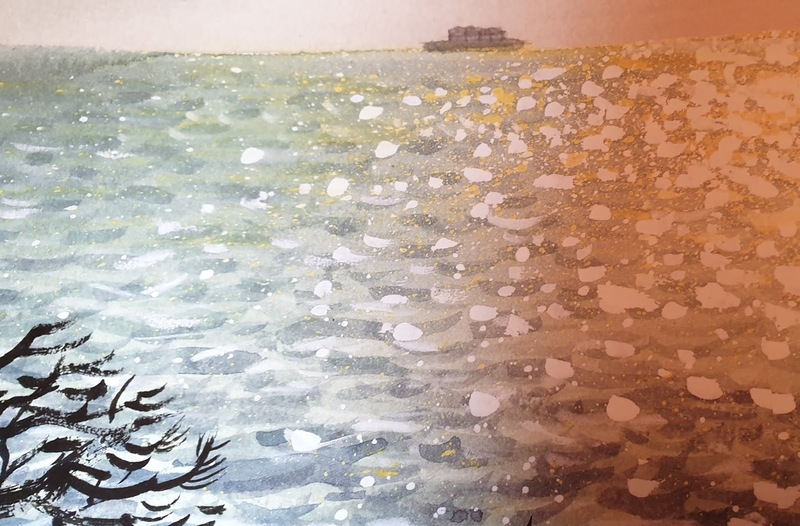 Sidney paints multiple versions of the sea double-page spreads, and then he keeps the one that seems to be going best. I suspect this is because although a lot of advance planning is needed, the watercolour is fluid and fast-drying, and so much depends on the specific brushstrokes. 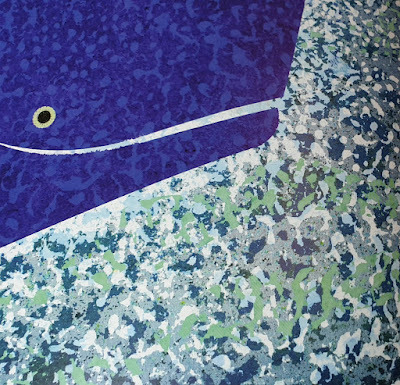 Here is detail from the bright, shimmering illustration by Sydney Smith. and the white gouache applied over the watercolour. 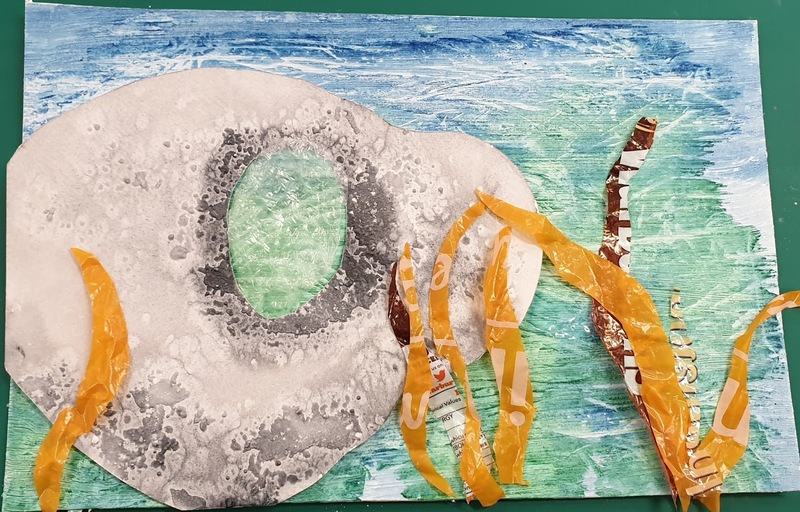 For the next illustrator, I could only find out that she includes collage in her illustrations. Victoria Semykina is a Russian artist, currently living in Italy. 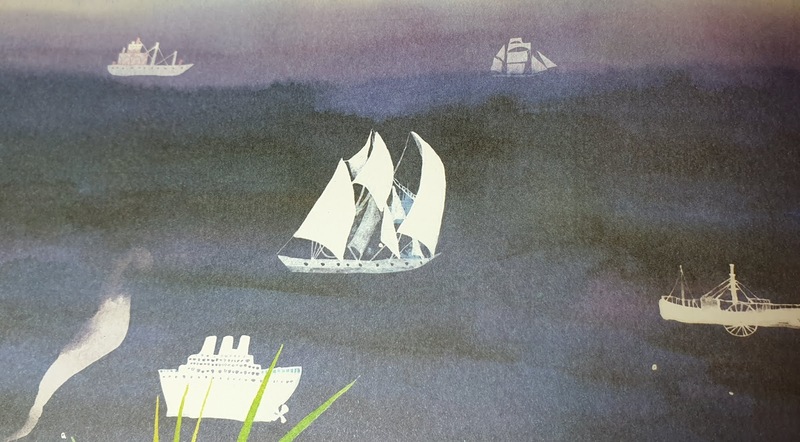 Looking at her picture book illustrations in The Real Boat, I suspect this new illustrator creates her own papers to use in collage (rather like Eric Carle, creator of The Hungry Caterpillar, fills drawers with his painted paper and tissue, ready to be collaged in future books). In addition, it looks like Victoria overpaints with watercolour or gouache and draws with oil pastels, but I am only guessing and I am sure she manipulates the 'collage' digitally. Does anybody know more? 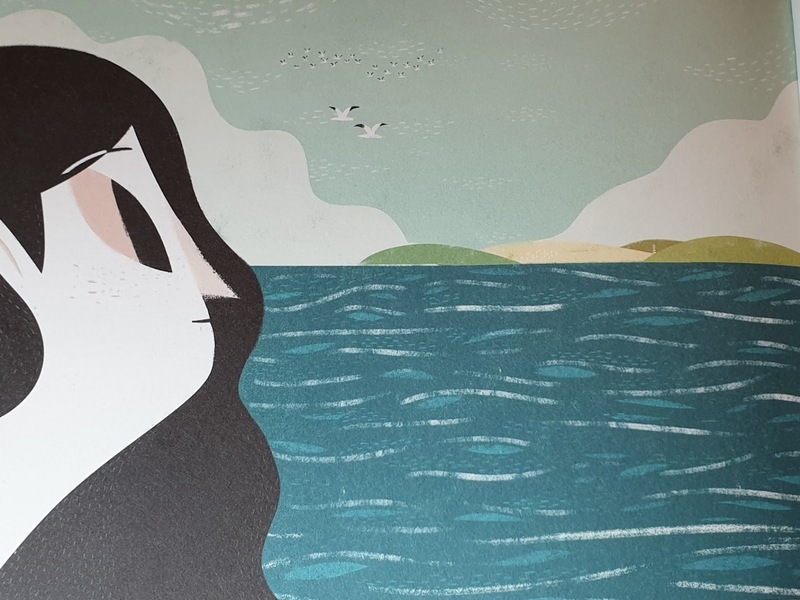 For me, it's Victoria's stylised, patterned illustrations that make this book . The next book is also the first by a new illustrator, and his award-winning book amazed me as it was all done with simple crayon, which gives it a contemporary retro look. If you saw my feeble efforts with coloured crayons, you'd understand my admiration. 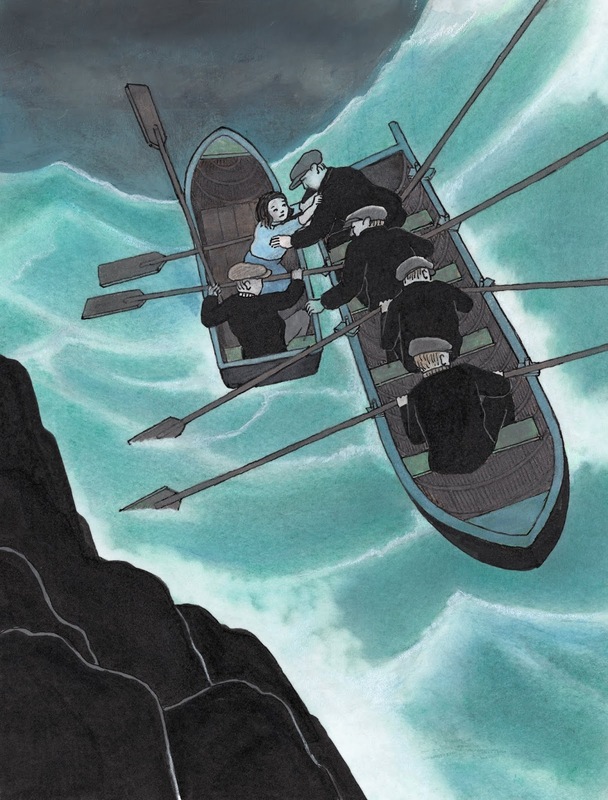 It's the narrative non-fiction children's picture book, Shackleton's Journey by young artist, William Grill. 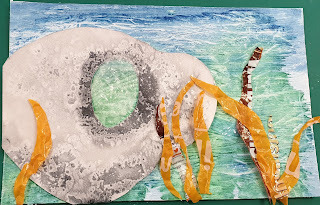 Here the white froth of the wave crests and light is simply white, uncrayoned paper. Churning, great waves, and we know they are enormous from the size of the boat.. Even if you are a world-renowned illustrator, sometimes you discover an Achilles heel, and drawing churning water flummoxed French-born artist, Tomi Ungerer. In a video Tomi talks about Fog Island (then called Fog Man), and near the end discusses his path to solving the problem of the waves. Tomi Ungerer, talking about Fog Island. Tomi explains how all his life (born 1931) he had a hard time drawing waves, despite during his later life living by the sea in Nova Scotia, and then on an Irish island. 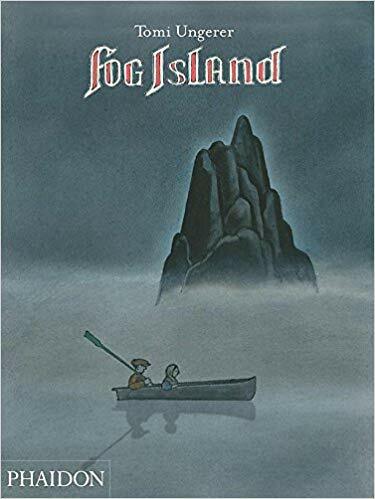 It was with the above illustration for Fog Island that Tomi developed a new technique. When he first attempted the waves Tomi was inspired by Hokusai's wave, but he was told his interpretation lacked movement and looked frozen. So Tomi Ungerer persevered and developed another technique. 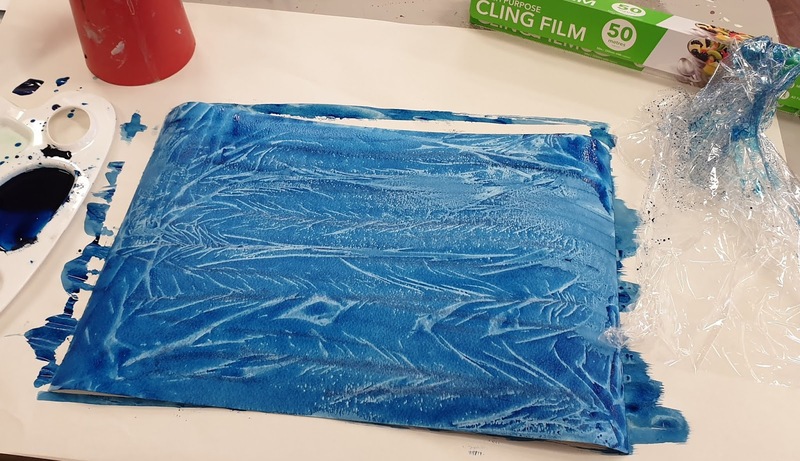 You might be able to see in the video image that Tomi uses semi-translucent transfer paper and he explains how green pastel was applied to the back of the transfer paper and pencil and gouache to the front, with extra, darker pastel where necessary. I was a little confused with the explanation, but that doesn't matter because what is inspiring is that an acclaimed artist experimented until the problem was solved, even though he was in his eighties. It was the same with the fog; Tomi assumed covering the drawing with light grey pastel would give the effect of fog, but discovered it wasn't that simple because real fog plays with perspective and he adapted that technique too. Poignantly, whilst researching Tomi Ungerer, I discovered this maverick, acclaimed artist had died the day before, aged 87 years. My heart lurched. 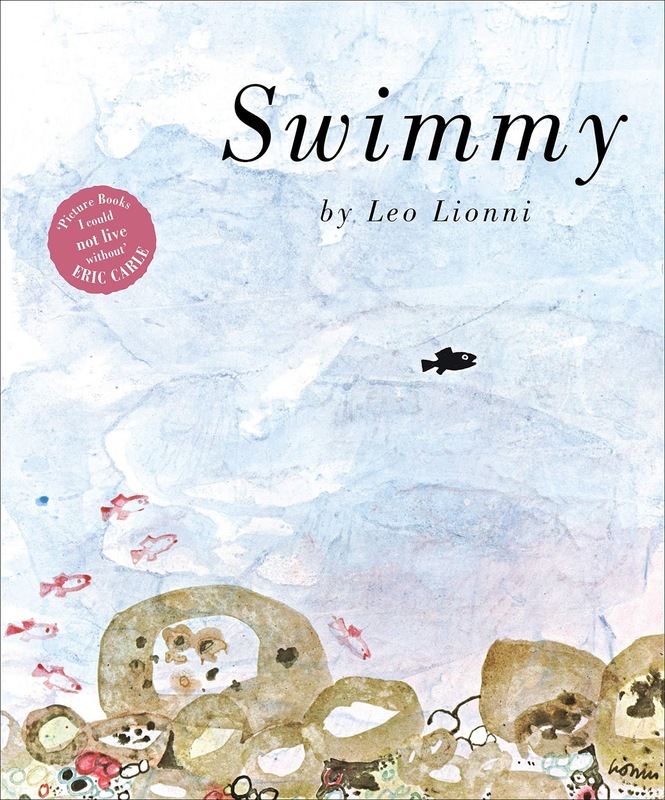 Another acclaimed, award-winning artist, Leo Lionni (also now departed), used a very different technique for water. I've only just discovered Swimmy by Leo Lionni, and it is now a new favourite, despite being first published in 1963. I first heard of this book through reading Eric Cale and Lane Smith praising the book and it has been recently reissued in the UK. Leo was an artist/graphic designer who didn't start producing children's books until his fifties. The cover is shown large so you can see the texture of the water. 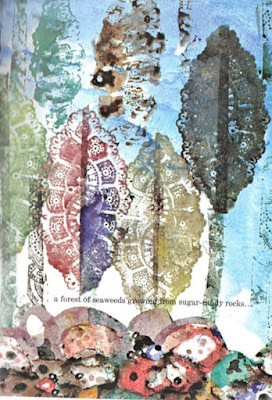 I gather Leo Lionni used a variety of mediums and for this book he used different stamps and printing, wax resist and plastic wrap (clingfilm) on diluted blue tempera paint. It gives such a feeling of loose, liquid, spontaneity. And the seaweed made me grin: he printed it using the ornamental edge of a napkin or doily. Maybe it is a little messy, but there is an innovative joy to the images and it oozes wetness! 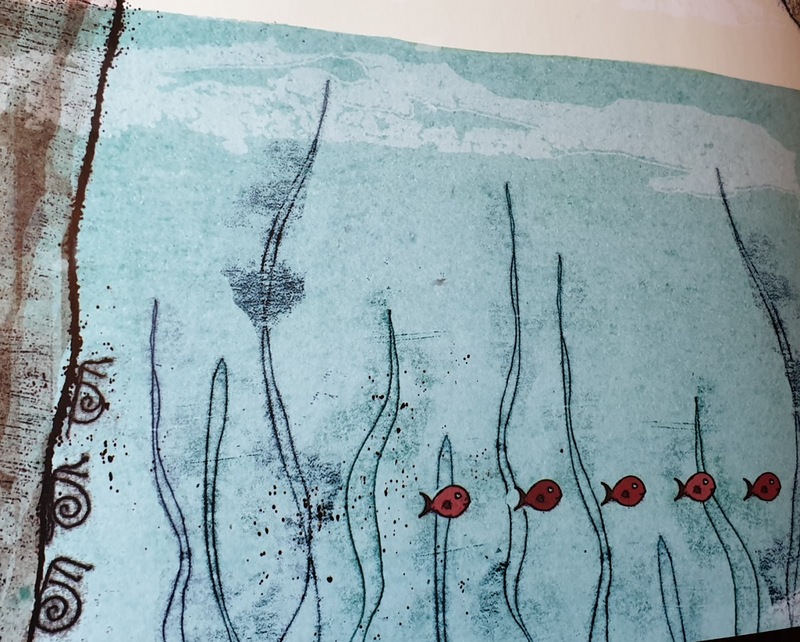 Perhaps some of my enthusiasm for Swimmy comes from the fact I've been experimenting with illustrating water on my course and only a week before seeing this book I'd been playing with watercolour and clingfilm. Snap! OK, I know I'm only a beginner, but as has been seen, all the professional illustrators experiment too. Paeony Lewis, having fun, experimenting. 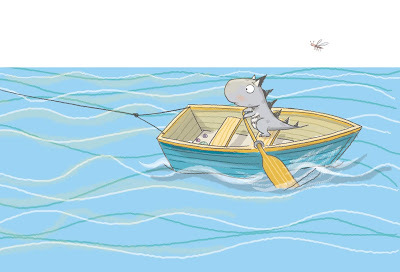 And finally, here are a few more examples of water from different children's picture book illustrators. I know how the first was produced (expressive linocuts), but can you guess how the others were created (and do let me know!). Excerpt from Roo the Roaring Dinosaur: Best Playday Ever! 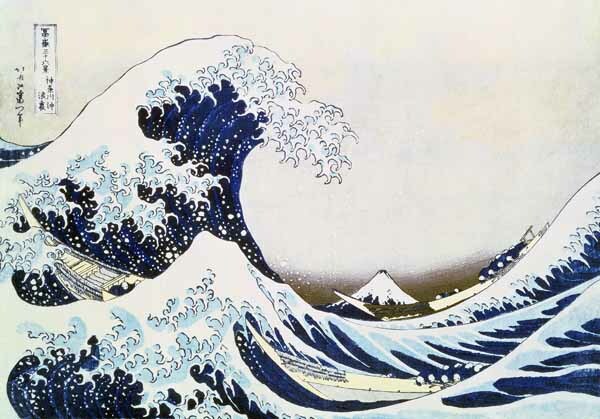 If you have any thoughts on illustrating water, or know of any great illustration examples, do share. Thanks! Gorgeous. Makes me want to get out the clingfilm and experiment myself. 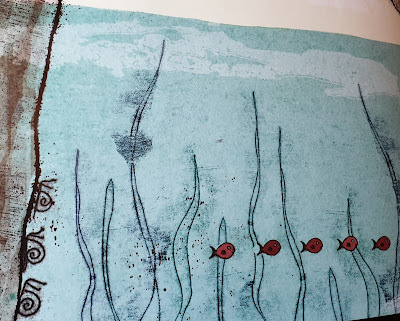 I have to give a shout out to Charles Fuge - each of his (undersea) bubbles in the Gilberts are mini masterpieces - and Cecelia Johannson's layered tissue paper collages made fab arctic sea backgrounds for a long out of print Tooth Trouble. Thanks and go for it, Jane! Plus I've just taken a look at my Gilbert book and yes, those bubbles are a delight. Looked up Tooth Trouble too (watched a dodgy video online!) and I wouldn't have guessed tissue was used. At the back of picture books, I'd love it if they told us about the art. Amazing art. That first Sydney Smith spread is one of my all time favorite picture book spreads. But I love everything here. The sun is so bright you can feel the shimmering heat. Thanks, David. Inspiring stuff Paeony! It really makes me want to get out and start experimenting more. Thanks for a lovely post. I'mn in awe of illustrators whatever thier style. 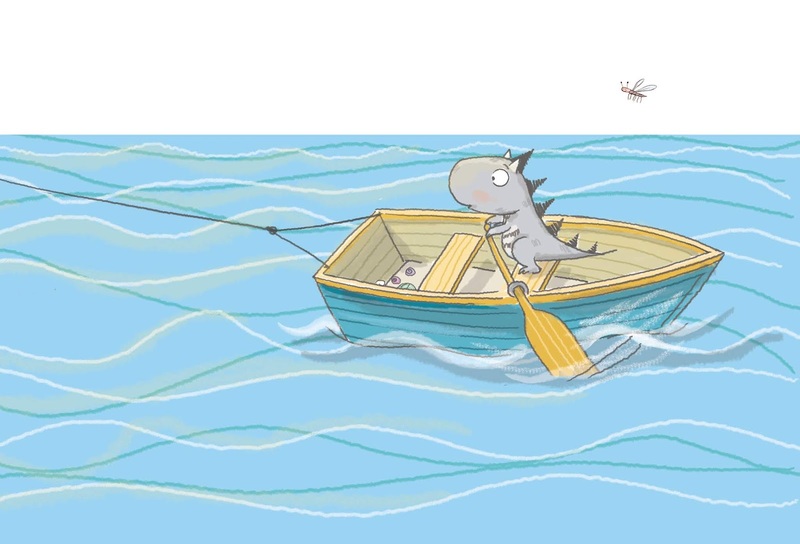 I'm often asked if I do the illustrations for my picture books. My standard answer is "I wish but I'm just not that talented." Thanks, Lynne. A tentative desire to try illustrating one of my own picture book texts got me started in art, albeit sometimes I feel it's enough that now I understand more when I visit an art gallery! Great post Paeony! 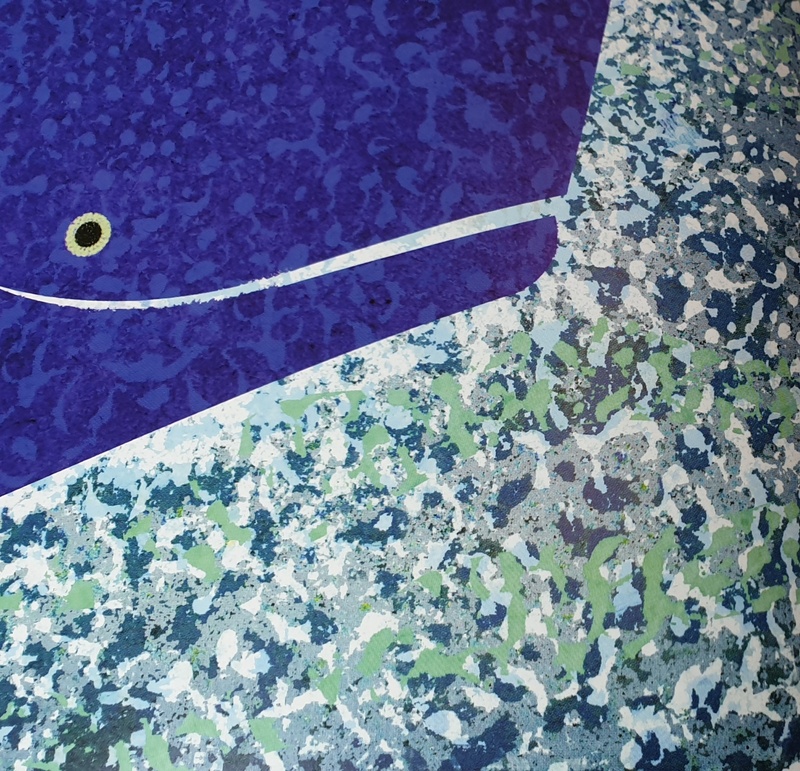 I think the technique used in The Crocodile Who Didn't Like Water by Gemma Merino is trace monoprint where. I’m sure you’ll know the technique but for anyone reading who doesn’t; you ink up some glass, put your paper over it and draw on the back so that the reverse image side picks up the ink with that beautiful jagged line. Many thanks and yes, Claire, I'm sure you are right. Well deduced! Very effective.